Aurora (population 142,990) is located in far northeastern Illinois in the southeastern portion of Kane County. Interstate Highway 88 passes through the northside of Aurora. Illinois Route 31 passes through town from north to south and U.S. Route 30 passes through the south side of town. The Burlington Northern Railroad line makes its way through town as well. The Fox River curves through Aurora from the north to the south. According to the 2000 Illinois Census Aurora is the 3rd largest city in Illinois. A nice history of the town of Aurora can be viewed at http://www.encyclopedia.chicagohistory.org/pages/91.html . In summary, this article tells us that the area of Aurora was first settled in 1834 with the town officially incorporated in 1845. Its location along the Fox River made it an instant success with the textile mill and grist mill industry. The Chicago, Burlington, and Quincy Railroad line made its way to Aurora in 1856 futher bolstering the town's industry. Aurora has grown from a population of over 11,000 in 1870 to today's (2000) population of over 142,000. Aurora Jennings Seminary got its start in the early 1850s as an idea for higher education from Reverend John Clark who moved to the area of Aurora from New York. Reverend Clark died in 1854 but his idea was carried on by his supporters. 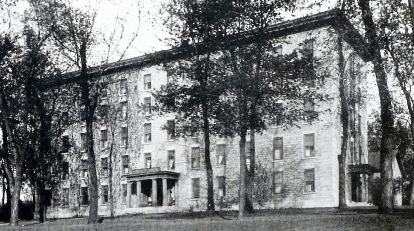 In 1855 the Clark Seminary School was chartered, fielding its first classes in 1858. In 1864 the Clark Seminary was sold to a religious group known as the Rock River Conference of the Methodist Church.. Mrs. Eliza Jennings was the biggest contributor toward the purchase of the school, hence the school was renamed in her honor to Jennings Seminary. The school averaged over 300 students during its first eight years under this name. The Deaconess Society of the M.E. Church took the school over in 1898. The school was then changed to an all-girls school from that year on. The school's enrollment that first year was 35 students. It soon grew to an average of 100 students for the next several years. Several improvements were made and many were proposed. The school continued as a strong academic facility for young ladies through the early 1940s. Financial issues and enrollment finally got the best of the school portion of the Seminary. Jennings Seminary High School was closed in 1942. In 1943 the facility was renamed Jennings Terrace. Sadly, the school building was destroyed in a 1959 fire. Aurora Jennings Seminary had a very strong academic foundation. The school often utilized the latest in instructional methods for its students. We are certain that several activities were offered at the school as well. It is likely that plays, clubs, and other activities were a part of the learning experience at Jennings Seminary.